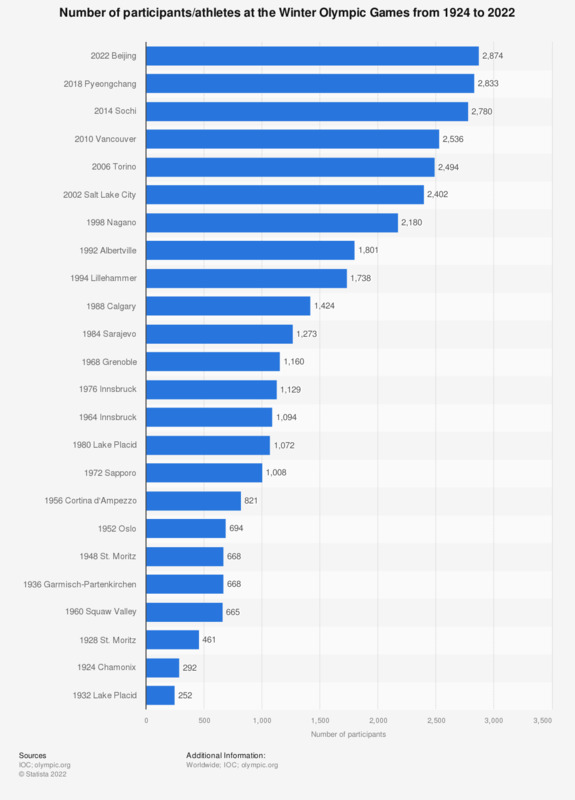 The statistic shows the number of participants in the Winter Olympic Games from 1924 to 2014. At the first Olympic Winter Games in Chamonix in 1924, 292 athletes participated. This figure grew to 2,536 participating athletes from 82 nations during the 2010 Vancouver Winter Olympics. * Approximated value In 1940 and 1944 no Winter Olympic Games were held. Should the U.S. be participating in the Winter Olympic Games in PyeongChang? Do you think the International Olympic Committee made a good decision in selecting PyeongChang to host the Winter Olympic Games? What do you think of the idea of Olympic Winter Games in Stockholm in 2026? How much of the 2014 Winter Olympics in Sochi do you plan to watch? Was the decision to hold the 2014 Winter Olympics in Russia a good or bad decision? Why do you think it was a bad decision to hold the 2014 Winter Olympics in Sochi?